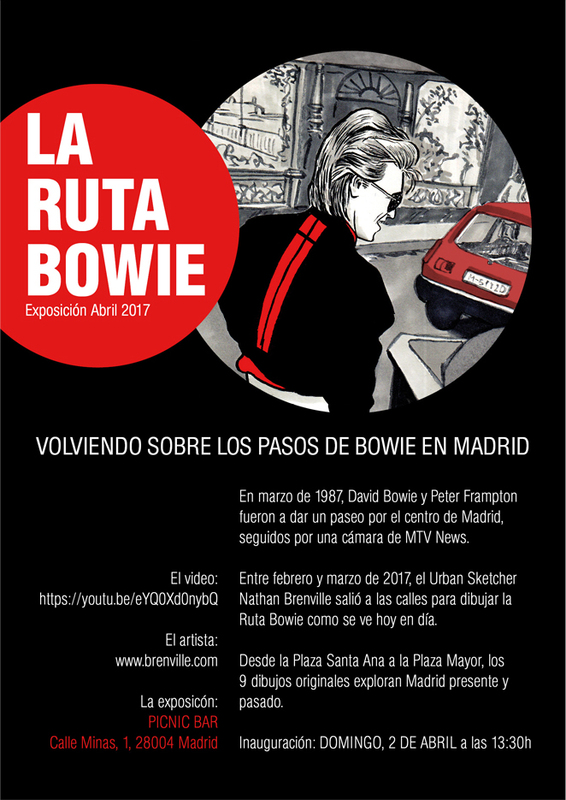 My drawings of Bowie and Frampton walking the streets of Madrid in 1987 were initially intended just to illustrate this blog, but I soon realised there was too many interesting places to draw. So when my favourite bar in Madrid, Picnic, asked me about exhibiting something on their walls, it seemed like the perfect opportunity. I spent most of March walking around sketching central Madrid. As an urban sketcher it was important to me to do as much on location as possible, to capture the life and atmosphere of the moment, although the bigger drawings involved return trips to complete them over several days, and my incorporation of Bowie and Frampton into the scenes mean that they're not 'true' urban sketches, since I used the video reference. But I wanted it to be a bit like a comic, and to tell a story. The exhibition will be up for all of April 2017. For more detail on how to get there etc, check out Picnic's Facebook event.